There are serious consequences if Hungary’s prime minister, Viktor Orbán, decides that someone is an enemy of his Fidesz party – especially if that person or entity has something to do with Hungary’s ever-shrinking independent media (or civil society, the government’s other arch-enemy). Regardless of these fears, Popper was able to publish articles on government corruption or the economic rationale behind being welcoming to refugees for years without a problem. Something changed this fall, however, and the newspaper’s publisher asked him to stop writing on political topics, explicitly mentioning the refugee issue. It is not known what intimidating tactic was used to influence the publisher, but the mention of refugees made it obvious that the small English-language newspaper, which is only read by Hungary’s expat business community, had annoyed someone close to power. If a small, marginal newspaper like the BBJ is deemed important enough to be silenced, then it is not difficult to imagine how far Fidesz would be willing to go in the case of Hungary’s leading left-wing daily, Népszabadság. On the morning of 8 October, Népszabadság’s journalists received a written notice that they would no longer be expected to come to work. Access to their email accounts had been blocked, and those who had come for the first time to the paper’s new office building to work on the online edition were not allowed to enter. Fidesz members and the party’s supporters commented on the suspension of operations at Népszabadság in a similar vein, arguing that it was the result of a rational economic decision, although they did little to conceal their elation over the closure. Fidesz Vice-President Szilárd Németh, for example, reacted to the news by saying: “It was about time to suddenly close Népszabadság […] I won’t shed crocodile tears.” And although there has been no official declaration that the suspension of operations will be permanent, distributors have already removed Népszabadság from their offerings. It is true that Népszabadság’s circulation had fallen from over 200,000 in 2001 to 38,000 in 2015, but it is nevertheless difficult to believe that the decision to shut down the newspaper was purely economic in nature. On 7 October, the day before the shutdown, journalists still believed they were about to move into a new office building, and the publishing house promised to order pizza for them while they were transporting their boxes from the old newsroom. Nor does it make sense to remove public access to a news site and its complete archive from one day to the next – unless, of course, there is something the owners (or those behind the closure) do not want the public to read. Népszabadság had been publishing numerous investigative articles that have caused serious difficulties for Fidesz politicians in recent months. Just a few days prior to the closure, it broke the story that Antal Rogán, the Head of the Cabinet of the Prime Minister, had used a private helicopter to fly to a wedding. The paper has also published extensive coverage of a recent scandal surrounding Hungarian National Bank Governor György Matolcsy, who arranged a high-paying job for his girlfriend at the institution he heads. These events were evidently too much for the leadership at Népszabadság’s parent company. Mediaworks CEO Balázs Rónai announced his immediate resignation, while his replacement, long-time CFO Viktor Katona, departed just three days later. The decision on the fate of Népszabadság was most likely taken by Mediaworks’ owner, the private equity firm Vienna Capital Partners (VCP). Interestingly, prominent Fidesz member and former Hungarian Foreign Minister János Martonyi sits on VCP’s International Advisory Board, although Martonyi has denied any knowledge of plans to shut down Népszabadság. VCP’s current owner is Heinrich Pecina, an Austrian businessman who is not unknown in Hungarian corporate circles. He is also well known to Austrian authorities, who have investigated him unsuccessfully on money-laundering charges, and his name can also be found in the Panama Papers, a gigantic trove of leaked documents detailing financial information about offshore entities that was published jointly by the Süddeutsche Zeitung and the International Consortium of Investigative Journalists (ICIJ) in April 2016. Pecina has a good working relationship with Zoltán Spéder, a well-known (former) Fidesz oligarch, and the current owner of Hungary’s first online newspaper, Index.hu. VCP holds a 24-percent stake in Spéder’s bank, FHB. This year, TV2, a station close to Orbán’s circles (as well as many online news sites associated with Orbán’s spin doctor, Árpád Habony) launched a smear campaign against Spéder, suggesting that he lives a luxurious lifestyle, has a mistress, and holds a fortune in offshore bank accounts. According to news reports, the Fidesz-controlled media were asked to produce these reports about Spéder because he fell out of favour with Orbán. According to industry insiders, the conflict between Spéder and the Prime Minister, as well as the investigative reporting on Pecina and the (unsuccessful) Austrian criminal investigation against him, led the Austrian businessman to sell Mediaworks. In addition to Népszabadság, Mediaworks has a wide portfolio of titles including regional newspapers (purchased from German publisher WAZ), which Fidesz could use to extend its media reach into the Hungarian countryside. In recent months, there have been rumours in the Hungarian press that Orbán’s ally Lőrinc Mészáros (who serves as the mayor of Orbán’s home village, Felcsút) plans to acquire a majority stake in Mediaworks. Népszabadság’s difficulties began in 2010, when two large media conglomerates, Axel Springer and Ringier, decided to combine their Hungarian operations. The Fidesz-controlled National Media and Infocommunications Authority refused to approve the merger unless Ringier sold its stake in Népszabadság. Ringier complied, and sold the paper to Mediaworks. Later, the Hungarian Socialist Party’s Free Press Foundation followed suit, selling its own 27.6 percent stake in the paper to the same company, which seems to have ended up in the hands of Fidesz, in line with a wider pattern of increasing Fidesz dominance over the Hungarian media. Already in 2006, the formerly Ringier-owned daily Magyar Hírlap fell into the hands of an oligarch close to Fidesz. Gábor Széles, one of the richest people in Hungary, bought the paper and transformed it into an extreme right-wing media outlet that often spreads hatred against Roma and refugees. Since then, Fidesz has been systematically taking over the Hungarian media: Orbán’s circle now owns the television station TV2, among others, as well as the country’s largest news site, Origo.hu. It has also established a news and opinion site called 888. There is some good news, however, despite all the gloomy developments: Hungarian journalists are not giving up. Independent newspapers and news sites such as 444 and Magyar Narancs are still very critical of the Hungarian government, investigative news start-ups like Átlátszó.hu and Dirkt36 keep digging up shady stories about corruption involving members of government and leading Fidesz politicians, and alternative news sites such as Kettős Mérce are demonstrating to Hungarian readers that there are still young and enthusiastic journalists who are willing to voice a different opinion than the one promoted by the government. 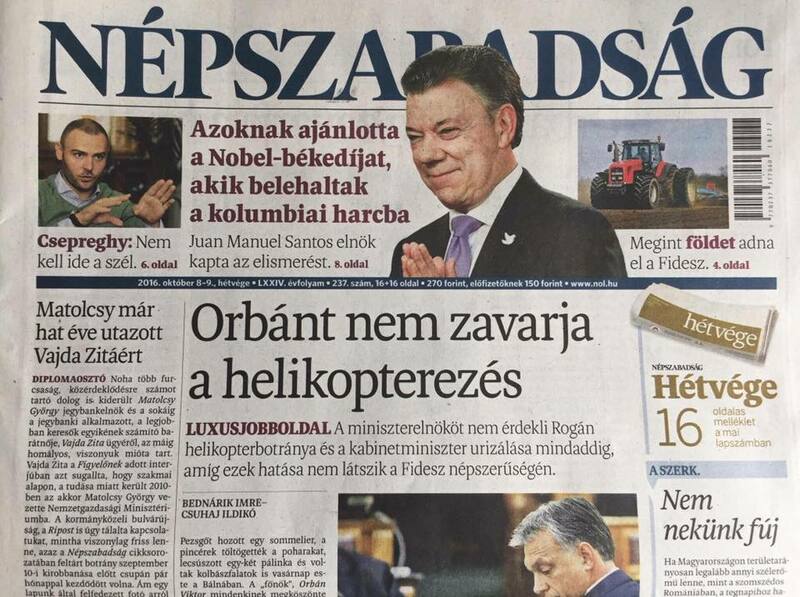 In an act of solidarity, Átlátszó has even offered a publication platform to a former Népszabadság journalist, while a former Népszabadság investigative reporter has decided to simply publish all the articles that had been scheduled for the coming week on Facebook. “Good luck shutting down social media, Mr Orbán,” he might have thought.